Car symbols, or dashboard lights, are a car service reminder. 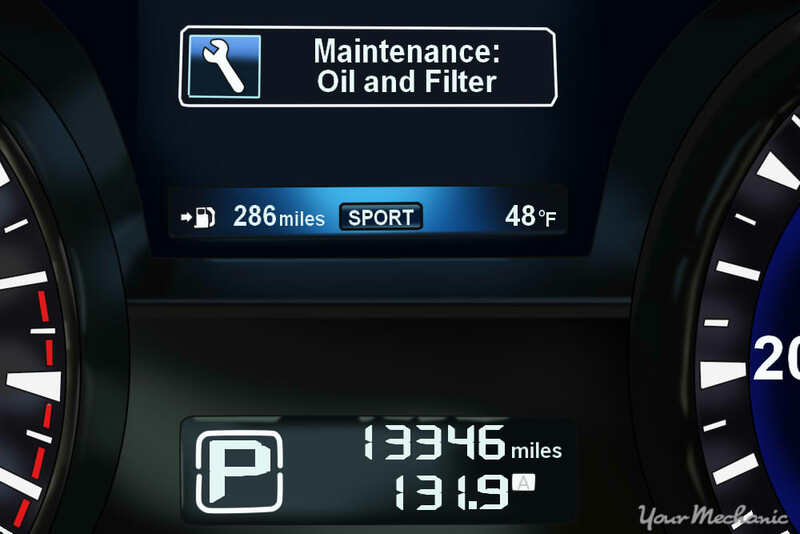 The Infiniti Maintenance Required light indicates when your car needs service. Most Infiniti vehicles are equipped with an electronic computer system, linked to the dashboard, that tells drivers when something in the engine needs to be looked at. Whether the dashboard lights trigger to tell a driver the oil needs to be changed, or the tires need to be rotated, the driver must respond to the issue as soon as possible and resolve it. If the driver neglects a service light, such as the “MAINTENANCE REQUIRED” light, he or she runs the risk of damaging the engine or worse, ending up stranded on the side of the road or causing an accident. For these reasons, performing all scheduled and recommended maintenance on your vehicle is imperative to keep it running well so you can avoid the many untimely, inconvenient, and possibly expensive repairs that come from neglect. Luckily, the days of scratching your head and performing diagnostics to find the service light’s trigger are gone. 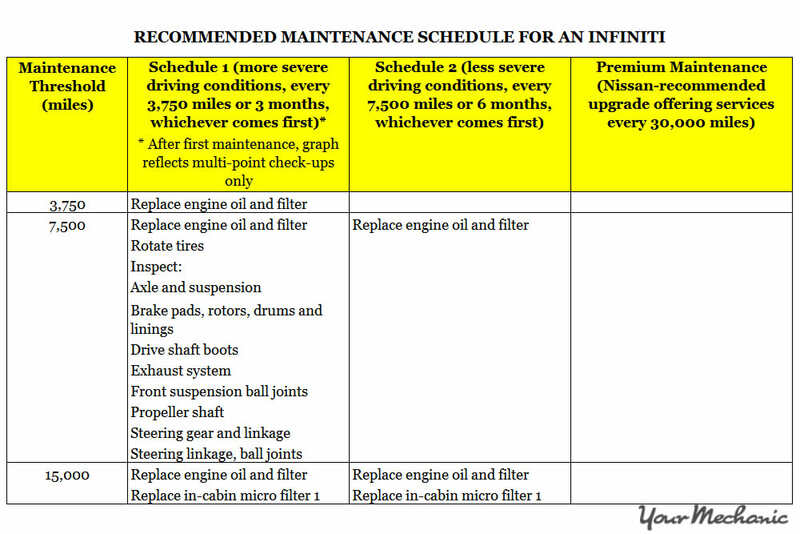 Infiniti’s maintenance reminder system is a simplistic on-board computer system that alerts owners about specific maintenance needs so they can address the issue promptly and without hassle. At its most basic level, it keeps track of engine oil life so you don’t have to. Once the maintenance reminder system is triggered, the driver knows to schedule an appointment to take the vehicle in for servicing. The sole function of Infiniti’s maintenance reminder system is used as a reminder for the driver to take their car in for an oil change, an oil filter change, or a tire rotation. The computer system tracks the engine miles from the time it was reset, and the light will trigger after a certain amount of miles add up. The owner has the ability to set the mileage intervals between the triggering of each maintenance light, depending on how the owner uses the vehicle, and under what conditions he or she drives. 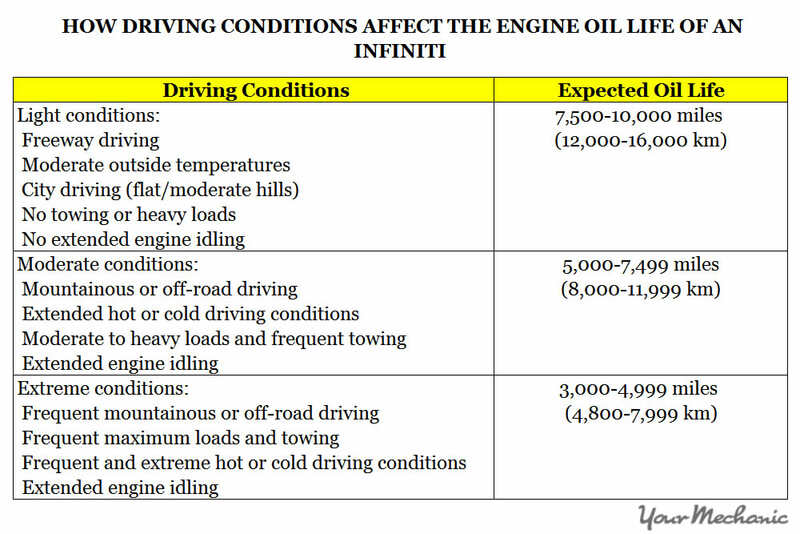 Since the maintenance reminder system is not algorithm driven, like other more advanced maintenance reminder systems, it does not take into account the differences between light and extreme driving conditions, load weight, towing, or weather conditions, which are important variables that affect oil life. Because of this, the maintenance light might be adjusted; for instance, to be effective for those who tow often, or for those who often drive in extreme weather conditions and need the oil changed more frequently. Be aware of your driving conditions throughout the year and, as necessary, have a professional determine whether or not your vehicle needs servicing depending on your specific, most frequent driving conditions. When the “MAINTENANCE REQUIRED” light is triggered and you schedule an appointment to have your vehicle serviced, Infiniti recommends a series of inspections that will help keep your car in good running order, and can help prevent untimely and costly damages to the engine, depending on your driving habits and conditions. Once your Infiniti has been serviced, the “MAINTENANCE REQUIRED” light will need to be reset. Some servicers will neglect to do this, which can lead to premature and unnecessary service light triggers. There are many different ways this light can be reset depending on your model and year. Consult the owner’s manual on how to do this for your Infiniti. While the Infiniti maintenance reminder system can be used as a reminder to the driver to have the vehicle serviced, it should be only be a guideline that depends on how the vehicle is driven and under what driving conditions. 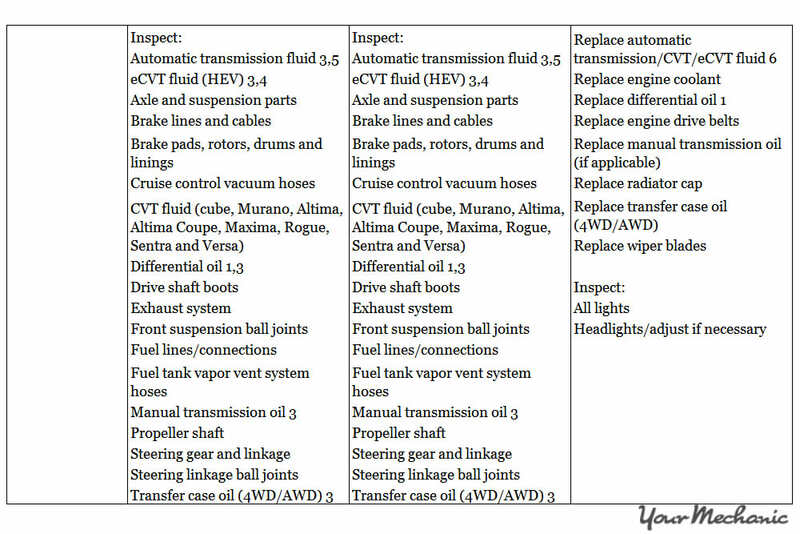 Other recommended maintenance information is based on standard time tables located in the owner’s manual. This does not mean Infiniti drivers should ignore such alerts. Proper maintenance service will greatly extend the life of a vehicle, ensuring it is reliable, safe to drive, covered by the manufacturer’s warranty, and it can also provide a greater resale value. Such maintenance tasks should always be performed by a qualified technician. If you have any doubts as to what the Infiniti maintenance system means or what services your vehicle may need, do not hesitate to contact our experienced professionals for advice. If your Infiniti maintenance reminder system is indicating that your vehicle is ready for servicing, have it checked out by a certified mechanic, such as one from YourMechanic. Click here, choose your vehicle and service or service package, and book an appointment with us today. One of our certified mechanics will come to your home or office to service your vehicle. 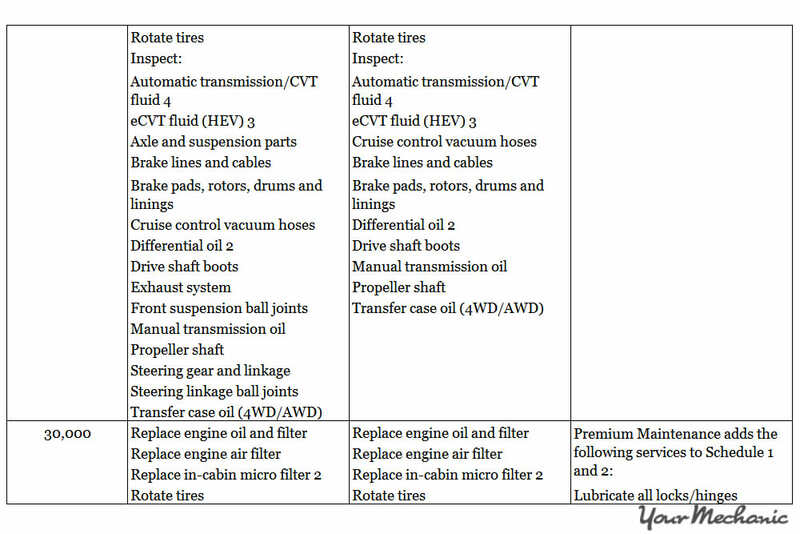 Q: Are common repairs on Mitsubishi Outlanders more expensive than on most cars? Q: Indicator lights on with B1 code.